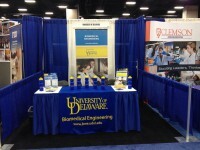 At the annual BMES conference in San Antonio, Texas in October 2014, UD’s BME program showed a strong presence. Our BME-affiliated faculty served as session chairs for 4 sessions. Moreover, 13 faculty and 3 graduate students presented 9 talks and 5 posters during the three day meeting, with topics covering biomaterials, drug delivery, orthopedic and rehabilitation engineering, tissue engineering and respiratory engineering. Read more.